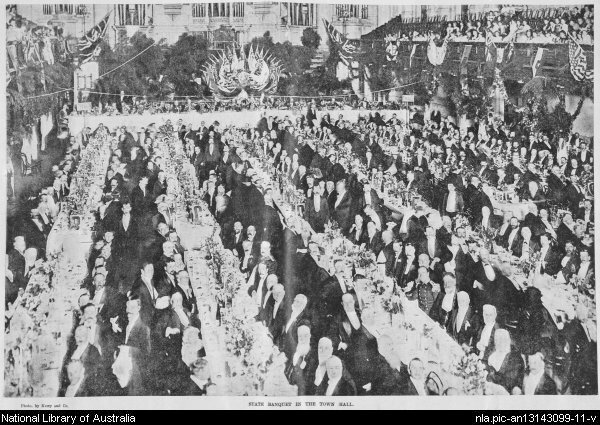 A grand Federation banquet at Sydney Town Hall celebrated the creation of a nation, as the separate British colonies joined together to form the Commonwealth of Australia. 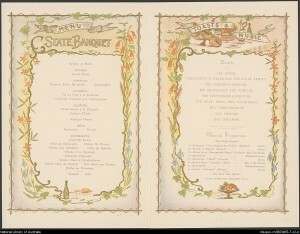 The menu was presented in French, perhaps to demonstrate the international credentials of the new nation and to show that these colonials knew how to do things properly. In the first century of European settlement, oysters were considered a cheap and abundant food and oyster bars or saloons flourished. Oyster beds were also dredged for shell to be ground up for lime. As a result, Sydney’s abundant natural oyster beds were almost obliterated by the end of the 1800s. Oyster cultivation began in the 1870s, so the oysters enjoyed as the hors d‘oeuvre at the Federation banquet were almost certainly the product of this early aquaculture. Turtles were plentiful in Queensland waters and by 1896 a substantial turtle meat and shell industry had been established. With the introduction of refrigeration, the industry expanded from around 1900. Turtle meat and turtle soup were also canned. The industry reached its peak in the mid 1920s, but continued in some form until 1968 when all turtles were declared protected species in Queensland. Turtle soup was difficult and expensive to make. 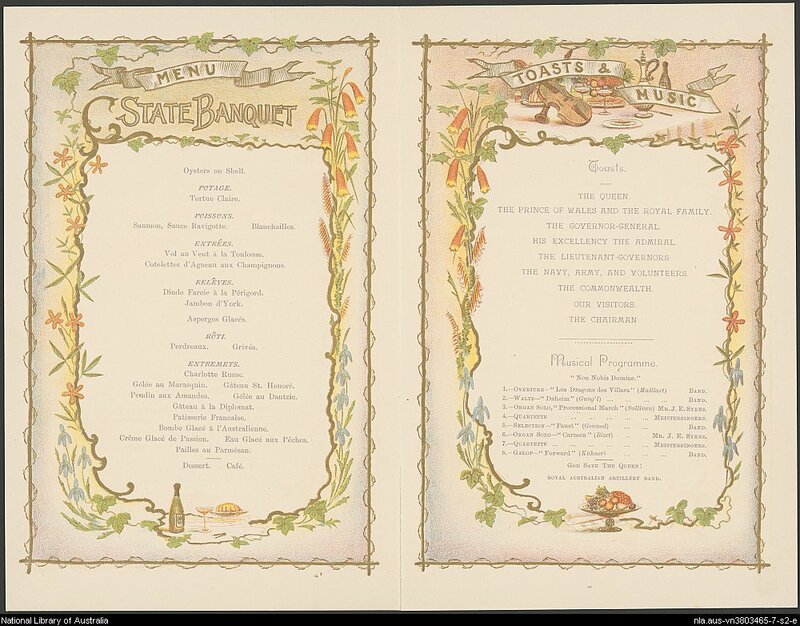 Prepared from the flipper of the green turtle, it was commonly served at civic banquets in the 19th century. Mrs Beeton called it “The most expensive soup brought to the table”. Consequently, many people made “mock-turtle soup” using a calf’s head. Turtle soup can still be found on American menus, especially in the south. Ah, Sauce Ravigotte. Or Sauce Ravigote? The two spellings seem to be used interchangeably these days, although French speakers would undoubtedly use a single ‘t’. ‘Ravigoter’ in French means “to invigorate” and a ravigote, according to Antoine B. Beauvilliers in The Art of French Cookery, is a collection of finely chopped herbs that invigorate a sauce. There are two quite different ravigote sauces. The warm variety takes a classic velouté sauce (similar to a béchamel, but made from stock rather than milk) and adds vinegar, butter, chopped herbs (tarragon is always included, but different recipes specify various others) and possibly a little wine. The cold sauce is more like the Italian salsa verde. Again it includes finely chopped herbs and vinegar, with the addition of capers, usually anchovies (although Escoffier omits them) and olive oil. Some recipes add egg yolk, others add mustard, while a modern American version includes garlic, lemon juice instead of vinegar and even tomatoes. The cold version of the classic sauce is the most common accompaniment to salmon, so it’s the one most likely to have appeared at the Federation banquet. The blanchailles (whitebait) were almost certainly served fried. Culinary lore demands that the entrée is cooked and garnished in an artistic way and usually served with a rich sauce. 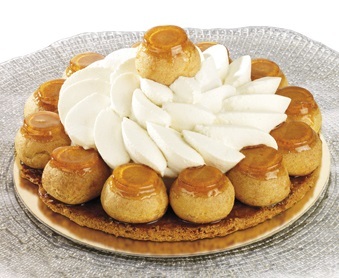 The pastry cases for the Vol au Vent à la Toulouse would have contained a white sauce (most likely a velouté enriched with egg yolks and cream) with other ingredients characteristic of Toulouse – potentially sweetbreads, mushrooms or even truffles. One French recipe for a sauce à la Toulouse uses mushrooms and truffles, but other menus of the period specify Vol-au-Vent of Sweetbread à la Toulouse. As grilled meats were not deemed suitable for entrée, the cutlets would be sautéed and served in a rich sauce. Are these dishes relêves, releves or relevés? From what I can see, the menu’s authors had their circumflexes and acutes in a twist, while web writers seem to have thrown up their hands and abandoned the accents altogether. The relevé (in English sometimes called a ‘remove’), was the course that removed or relieved the entrée. It’s the main meat course. À la Perigourd suggests that the stuffed turkey may have contained truffles and/or foie gras, as these are the signature ingredients of the region. 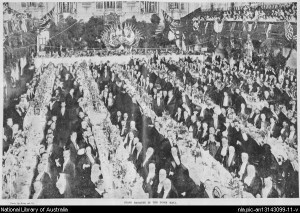 In 1897, fresh truffles were selling in London for up to 30 shillings a pound.What condition the Federation banquet truffles were in is open to debate, as fresh truffles could not have survived the lengthy sea voyage to Australia and locally-grown ones were long in the future. Truffles are often mentioned in recipes in the 1880s and and ‘90s, which leads me to believe they were readily available, if expensive, in preserved form. Australian newspapers carried household hints suggesting diamonds of truffle as a garnish for everything from sandwiches to consommé, while The Capricornian in 1893 gives directions for a boiled turkey stuffed with truffle. The composer Rossini, who gave his name to the truffled tournedos of the same name, was particularly fond of turkey stuffed with truffles. He claimed to have wept only three times: when his first opera failed, when he first heard Paganini play the violin, and when a truffled turkey fell overboard during a boating picnic. The roast course usually consisted of game or poultry. In this case, there were partridges and thrushes. People have been eating thrushes for at least 12,000 years, and the eating of small birds is still common in parts of Europe, particularly Spain and Italy. A Victorian era recipe begins: “Pick, draw, and singe six thrushes or robins; stuff them with forcemeat made of four ounces of lean cooked ham cut in dice, and as much finely chopped sausage meat…” Truffles and foie gras are added to the stuffing and the spit-roasted birds are finally served on canapés with a mushroom sauce. We would call these desserts, but on the classic menu, this course is called entremets (literally, “between servings”) and would usually, as here, include hot or cold sweets, gateaux and icecream. Several of these are classic recipes: the Charlotte Russe and Gateau à la Diplomat are varieties of cake with fruit topping; the Gateau St Honore (named for the patron saint of bakers) is made of pastry with a rich cream filling. Two jellies were served. One (Marasquin) was flavoured with the cherry liqueur, maraschino. The Gelée au Dantzie would have been flavoured with a type of liqueur from Dantizie in Germany. The Modern Cook, published in 1859 by Charles Elme Francatelli describes this as “Dantzie brandy(sometimes named gold-and-silver water)” while Nancy Lake in her 1903 guide “Menus Made Easy; Or, How to Order Dinner and Give the Dishes Their French Names” describes it as cherry brandy. The Pailles au Parmesan – cheese straws – should strictly speaking be a separate course – the savoury. Dessert – derived from desservir (to clear the table) – was normally fruit, nuts and small sweets.